Set in 1890s Paris, The Witch of Painted Sorrows is an irresistibly atmospheric, flavorful and intensely captivating gothic novel. 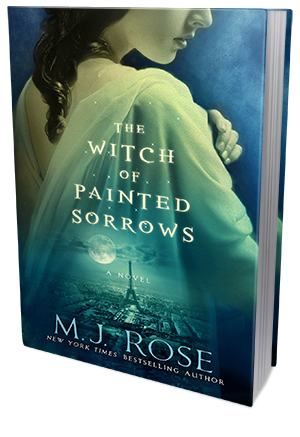 I was thoroughly impressed with M.J. Rose's smooth and spellbinding writing style and the amount of historical and cultural detail she included in this story. The combination of the sensual, sexually charged plot line, the gripping intrigue, the emotionally powerful and deeply intimate details of the main character's life and the breathtakingly painted historical tapestry of Belle Epoque simply swept me off my feet. I think I found my new favorite historical fiction author! Sandrine Salome arrives in Paris hoping to find refuge from her dangerous husband at her grandmother's lavish and breathtaking mansion. However, upon her arrival, she discovers the mansion is empty and locked up, and her grandmother explanations seem rather suspicious and evasive. Together with charismatic and fascinating young architect, Julien, she begins to explore Paris's night world, with all its forbidden and dangerously alluring sides, dipping her fingers in the occult and exploring her deepest desires. The Witch of Painted Sorrows surprised me. In a very good way. The story was more substantial and more captivating than I expected. The suspense kept me turning pages and I was undeniably mesmerized by Rose's evocative prose and careful world building. On top of everything else, this book was simply very entertaining to read. I gasped, I blushed, I held my breath a few times, and I kept on turning pages, telling myself "just one more chapter", "just one more page". I just couldn't put it down. Art, erotica, witchcraft, danger, possession, history - The Witch of Painted Sorrows has it all. It's an explosive and highly addictive blend of flavors and themes, and I am certain fans of paranormal mysteries set against rich historical backgrounds will find this book truly unputdownable. I know for sure, I will be following M.J. Rose's writing carrier closely.